After a Saturday night of celebrations and dancing, we met up at the newborn statue, somewhat ready for a new day and a new adventure. A much needed coffee later and we were on our way to Prizren. 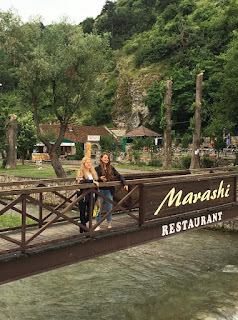 Upon arrival, we were welcomed by the sound of the beautiful River Marash, the sight of Turkish flags and their smiling white moon crescents waving at us from windows, as well as the iconic Albanian eagle flag, soaring high up in the air. Then began our trek up the cobbled winding strets. With our "I've-only-slept-5-hours" faces, we climbed up to our first stop: an Orthodox church, partly finished but partly still roofless. Our guide informed us that this site had been subject to vandalism in recent years which explains the presence of KFOR officers. The church itself overlooks Prizren's blushing rooftops and I was suprised by the amount of minerets rooted between the houses of the city. As I stood there, I became very aware of the location of the crumbling church; somewhat isolated and out of reach whilst the mosques stood strong, carved into the urban layers of Prizren and its people. With Peppi's professional hiking skills and seemingly never-ending energy leading us, we continued our journey up until we reached the stone wally of the fortress of Prizren, built some 3000 years ago. The cooler air and greenery was a refreshing change from the bustling roads of Pristina. 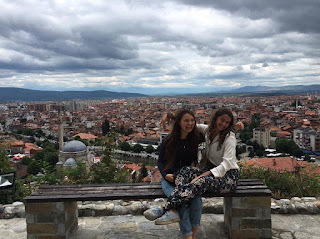 Our guide pointed out some of Prizren's famous landmarks as well as certain military bases, primarily used by Turkish and German peacekeeping forces. To me, this highlighted the ongoing political issues of Kosovo, that continue to affect even the most charming of cities. With great care, we walked back down (although the term "landslided" is perhaps more appropriate here) to the heart of the city. 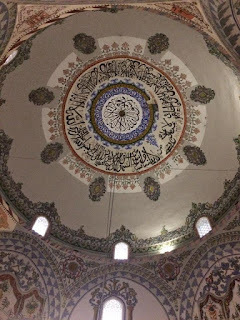 There, we visited the Sinen Pasha mosque, one of the oldest in the Balkans and listened to a Quranic reading that echoed throughout the Ottoman inspired architecture. A few moments later, and we were in a newly renovated Orthodox Church situated just a few metres away from the mosque. Freedom of religion and particularly the freedom to chose a belief system, appears to be the pillars of Prizren's society. But why is this city such an exception? Here bridges connect and don't divide, here inter-faith dialogue takes place both visually and symbolically and above all here, multiculturalism seems to have worked. 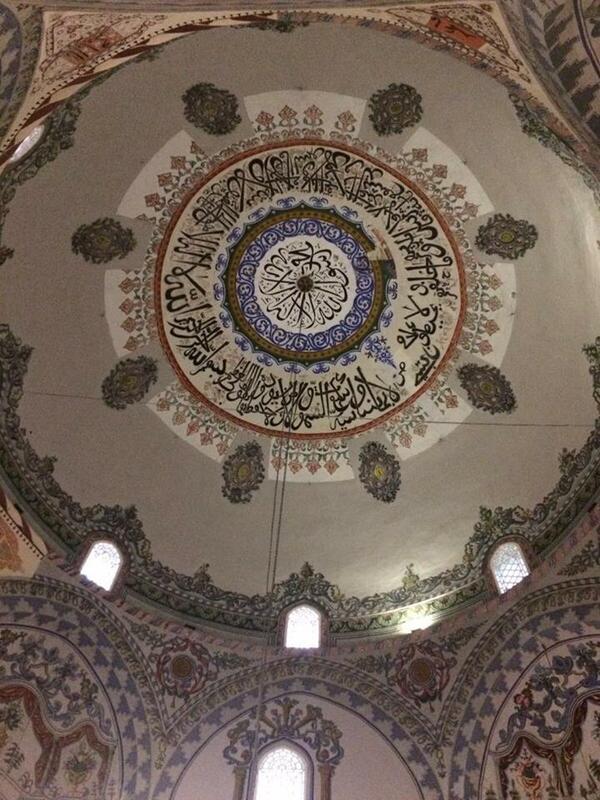 The answers to this question are complex but as our tour guide explained, relate to the Ottoman legacy. Under the Sultan's rule, a millet system was created in which each region or community was allowed to conserve its religion whilst ensuring its "non-imposed" status. This meant that religions could flourish and develop equally and harmoniously. 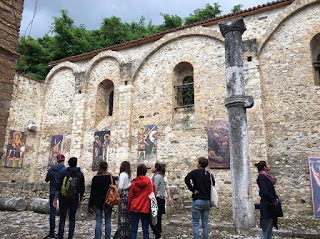 I believe Prizren also benefited from this system as it presents a diversity of religions. This visit also made me question the notion of secularism. To me, it is similar to democracy in that many believe it is the only and most ideal way in which a society must be structured. Having lived in France all my life, I can easily say that I too have been a victim of "secularist" thinking. But here, I saw an alternative: the presence of religion in the public sphere as a way to encourage coexistence and respect and remove the censorship of religiosity that we find in certain Western countries. However, all these thoughts need to be taken with a pinch of salt. The term "perspectives", coined by Ilen as the "word of the trip", is also applicable here. Whilst religion is an open topic in Prizren, our guide mentioned the need for recent laws to be implemented, sentencing fighters who leave Kosovo to join extremist groups in the Middle East. There is still thus a tendency for religion to be distorted and misused. But on the whole, our trip to Prizren gave me a fresh sense of hope that there is in fact such a thing as "successful multicultarism" and it does not automatically lead to the creation of parallel societies in which different group are completely polarized. The day ended with a warm dinner, some interesting "never have I ever" questions and a perfectly timed breakdown of our bus, when fatigue and the desire to sleep had reached its climax. Thankfully, we were assured that a bus would come in 20 minutes which in Balkan language, translates to 50 minutes (a lesson I will remember from now on). Our quest for understanding of this region seems to never stop, no matter the time or place. What are these crazy entities we call states? Crossing borders or crossing boundaries? Prizren: an example to follow for Kosovo? Where does the Ibar Bridge lead to?